In subsequent posts I will share the brain saving, waist whittling, belly fat blasting, muscle making, mood lifting, skin smoothing, stress subsiding properties of walking in the great outdoors….anyone want to chime in here on how walking has helped you to find balance in your own life? I totally concur with you Candace: walking rocks!! 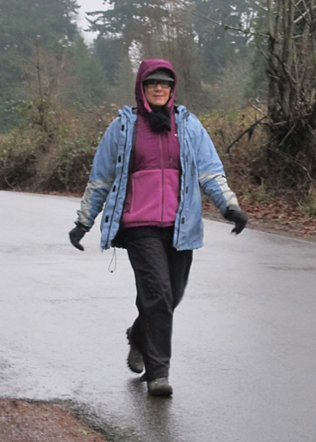 I have been an avid walker since my late 30’s, so well over 20 years. I started out as a runner and did a fair share of fun runs over the years, which I loved! But I lived in Dallas TX for 4 summers and running in that blistering heat did not work for me so I switched over to walking. One of the many wonderful things about walking is that your joints are spared: each step you take puts only 50% of your weight on your knees and hips, as opposed to running, which hits your joints up with 100% of your body weight. Plus you burn the same amount of energy per mile so it makes sense to walk, particularly as we age. And living in OR makes it VERY easy to get out just about any day of the year, as long as you have the right clothing!! You are looking very stylish in your rainproof gear, my dear!! No excuses…….